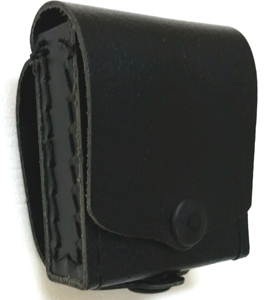 This is a black cowhide leather case for the NP88 pager. The dome snap on the optional cover will protect the display from damage and allow easy access to read messages. A simple press on the leather over the reset button will be enough to activate the button. Perfect for use in adverse environments. Installation is simple with a small leather strap and dome snap at the bottom of the case. The pager is held securely in the case with the pager clip locked into a small opening in the back of the leather case.